I wasn’t planning on eating out in January. I know, I know, bear with me. I’m not really one of those types. I mean, I don’t do full on detox or ‘Dryanuary’ or anything. But after a very indulgent Christmas December I definitely needed to take it easy for a few weeks. I assumed that meant not eating out for a while. As despite being pretty good at eating well at home it’s often difficult to do in a restaurant. 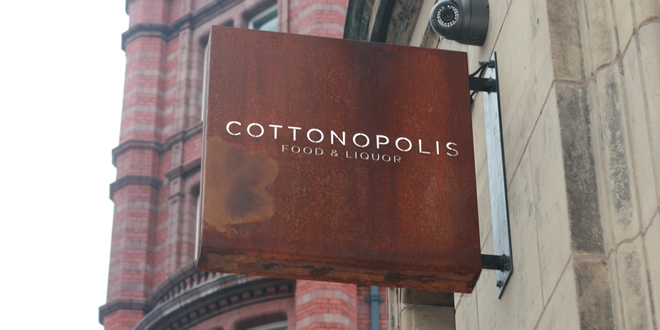 Step in Cottonopolis. 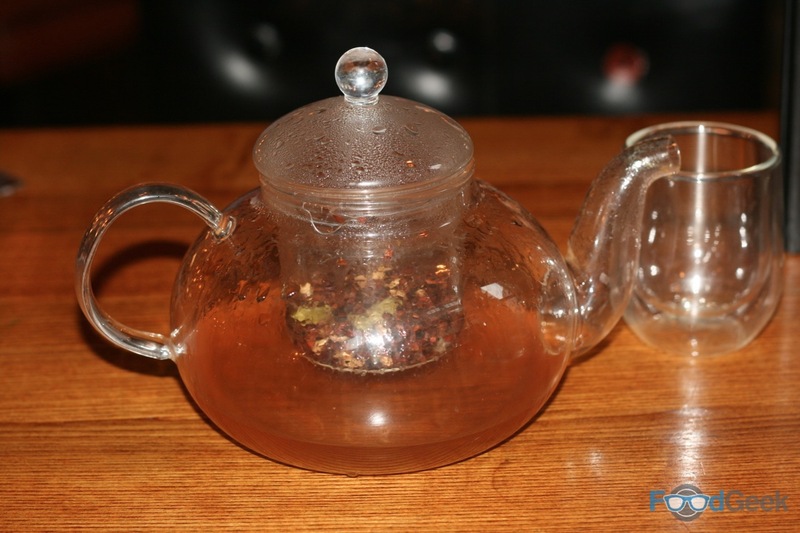 The Northern Quarter restaurant has partnered with artisan tea-blender Quinteassential to create bespoke menus that promise to Detox, Cleanse and Revive. I liked the sound of that and to be honest, after not going out for a couple of weeks I was losing the will to live. I really liked the decor of the Grade II-listed building on the corner of Newton Street. Exposed brick walls, metal doors and old school floorboards. The large bar running along one side of the room and the open kitchen at the end are the centrepieces. We took a seat at one of the slightly odd shaped tall tables by the window. 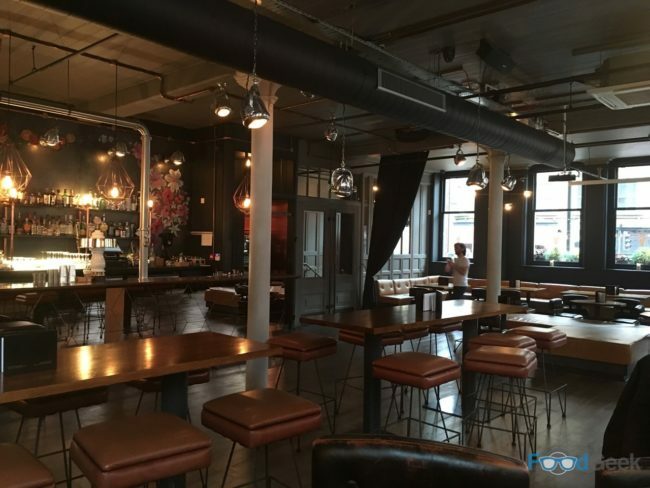 With a great view of both what was going on in the restaurant and in the outside world. 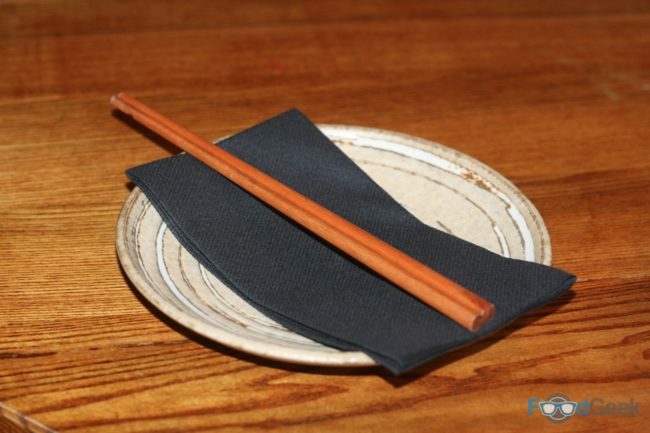 The regular menu looks great, full of interesting sounding modern dishes with a big Japanese/Asian vibe. But we were here for the January ‘Namas-tea’ specials. 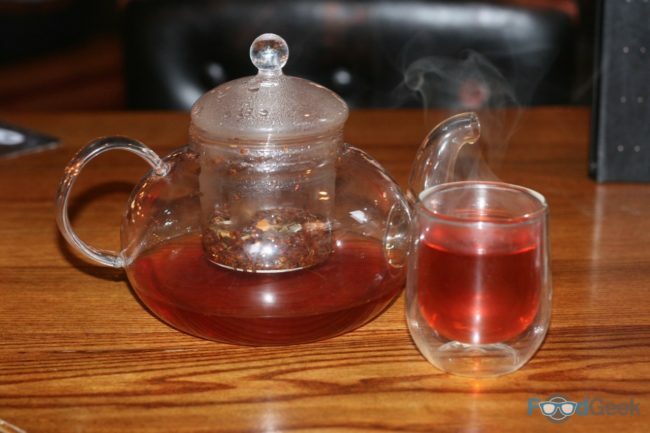 A choice of main course and side dish are served with a matching tea to compliment. 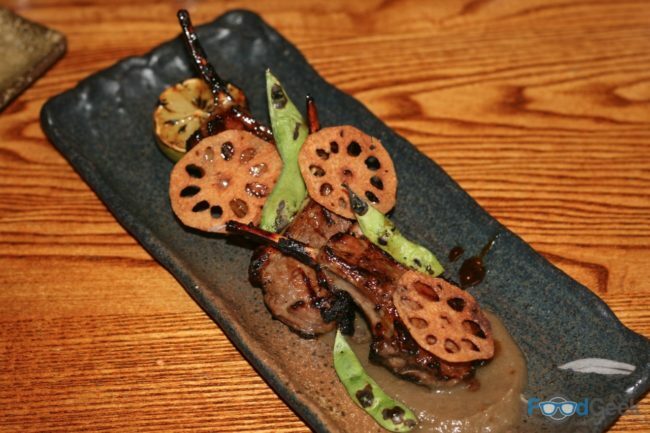 I went for ‘Lamb Nasu’ from the ‘Revive’ section. Gnarly, charred lamb cutlets marinated in savoury, umami rich miso served on a wonderful smoky aubergine puree. Finished with deep fried lotus root, charred lime and edamame it was a fantastic combination of flavours and textures. My side of ‘Wakame Salad’ was also excellent. 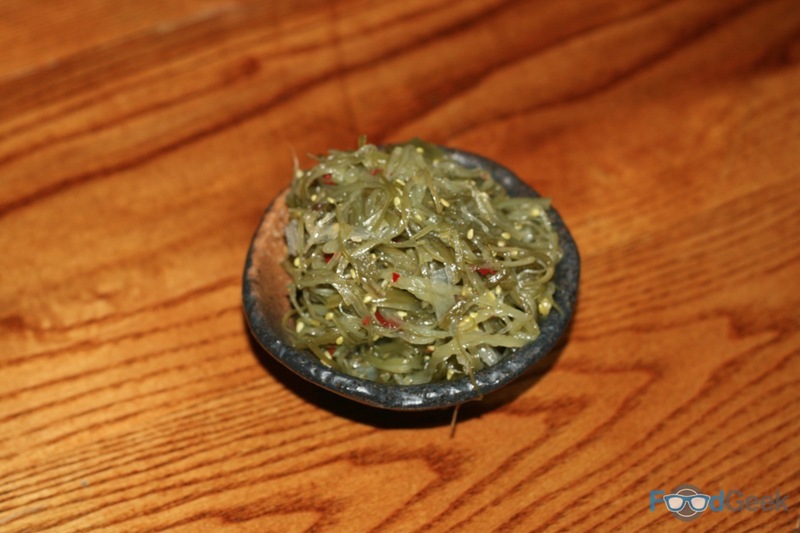 Cold noodles with salty seaweed, loads of sesame – oil and seeds – and a touch of chilli. It came with ‘Tales of the Orient’ tea, a caffeine-free Rooibos, blended with lemongrass, mango and pink pepper. It was a bit sweet and fruity for me. Actually it tasted like liquidised Tunes (the cherry menthol sore throat sweets, not the music kind). Never mind the tea though, the ‘Tuna Tartare’ was equally as good as the lamb. 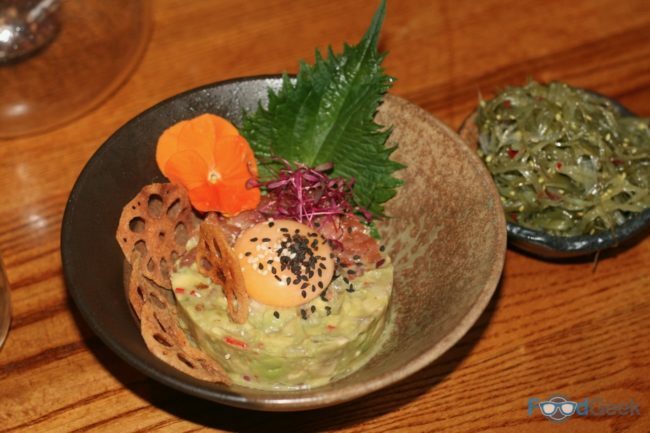 Quality finely sliced raw tuna is topped with smashed avocado, a warm egg yolk and more of those amazing lotus crisps. I definitely felt cleansed by the end of the bowl. 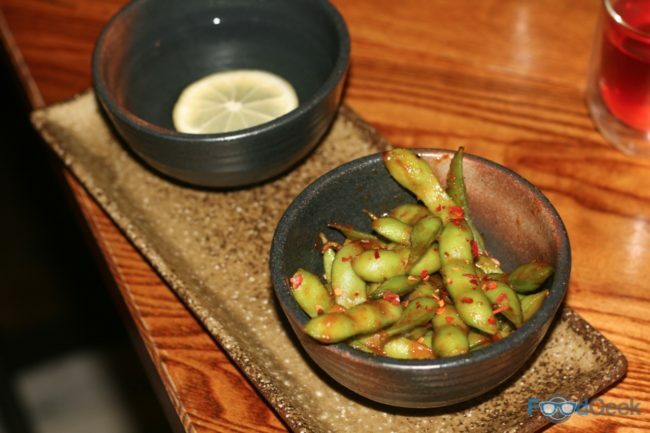 I’m always a fan of edamame beans but even more so when they’re coated in a spicy miso sauce. I much preferred the accompanying ‘cleanse’ tea. It was far less sweet with subtle spices of cardamom and ginger along with oats, dates and cacao beans. The ginger in particular worked really well with the tuna and avocado. I’ve got to be honest, I was genuinely worried I’d still be hungry after my main course. But there was no need, I was much fuller than I expected. I could (and should, from a health point of view) have happily left then and been more than satisfied. But I went and ruined it by having dessert. 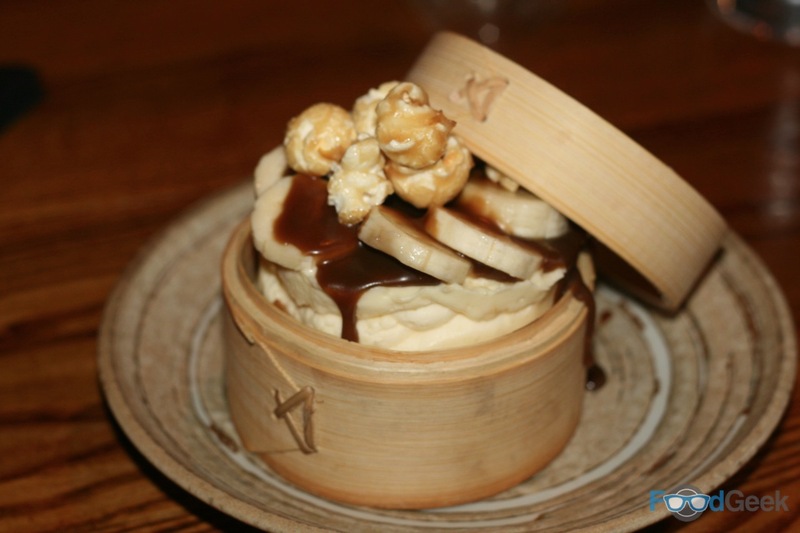 Both the ‘Banoffee Popcorn Cheesecake’ and especially the ‘Akashi Mess’ were great though. The cheesecake pretty much as described, rich and indulgent. 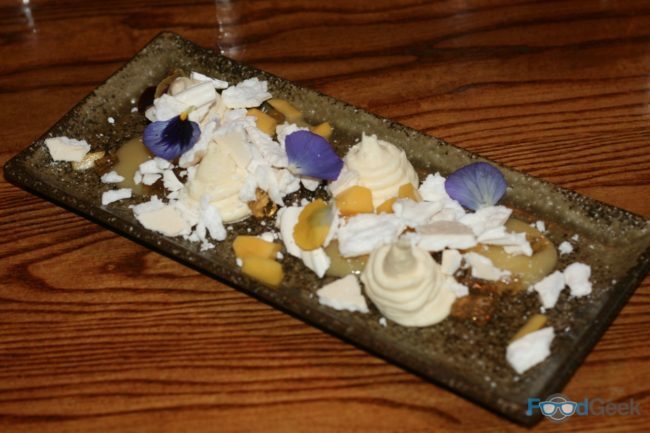 But the mess felt quite light and was full of interesting tropical fruit flavours with sake jelly, meringue and a big citrus hit from yuzu curd. I was ridiculously full after finishing dessert. Oh well, they tasted so good I didn’t even care. At least the first half of the meal was healthy. And I drank cleansing tea! 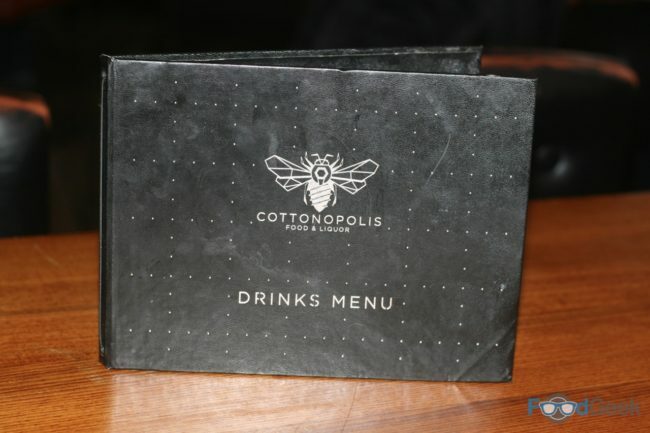 Overall I really enjoyed Cottonopolis. 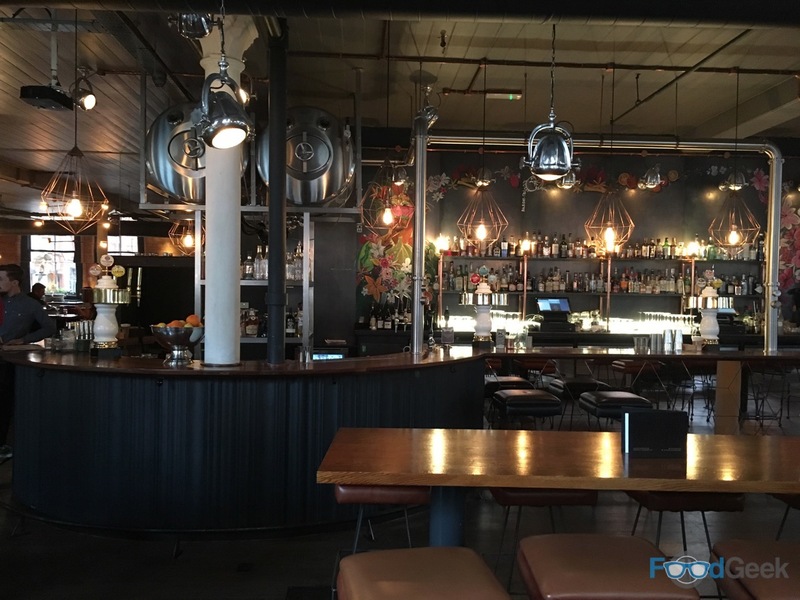 It has a really relaxed atmosphere and a menu full of the foods I love to eat. It’s a great idea to create a detox menu for health conscious diners in January. 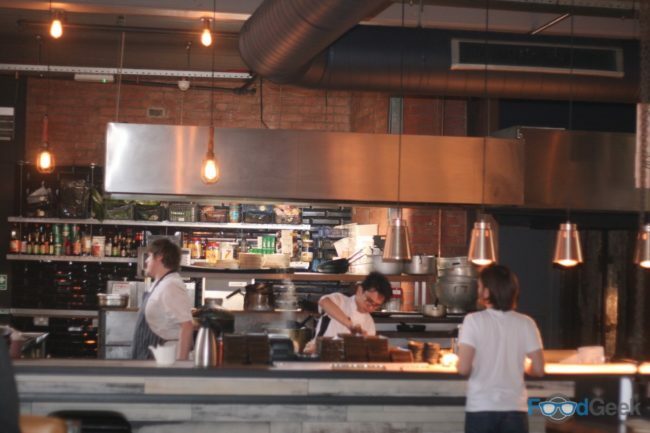 Although, there are plenty of similarly healthy dishes to be had from the rest of the menu too. I’ll definitely be back for them soon. 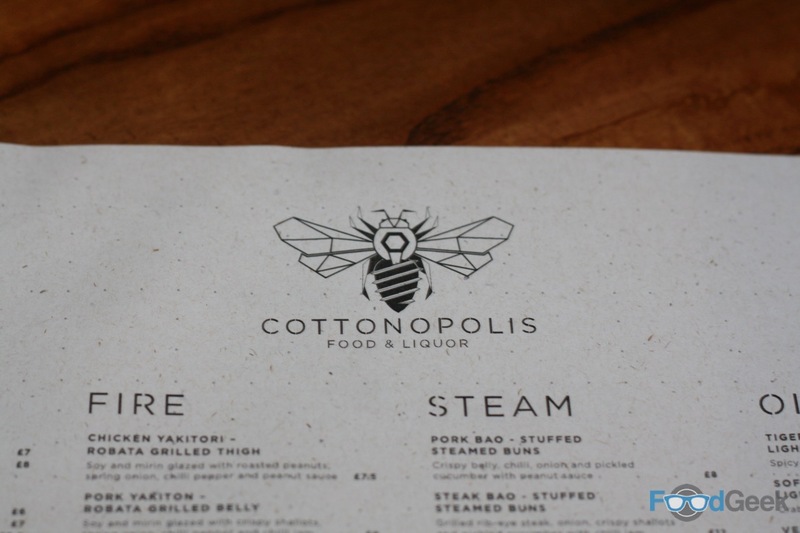 Disclaimer: I was invited to Cottonopolis to review the Namas-tea menu. As you know this does not guarantee I will say nice things. All views are my honest opinions etc. I already have plans to return for most of the regular menu. My wife went to cottonopolis this week, said it was a bit special! 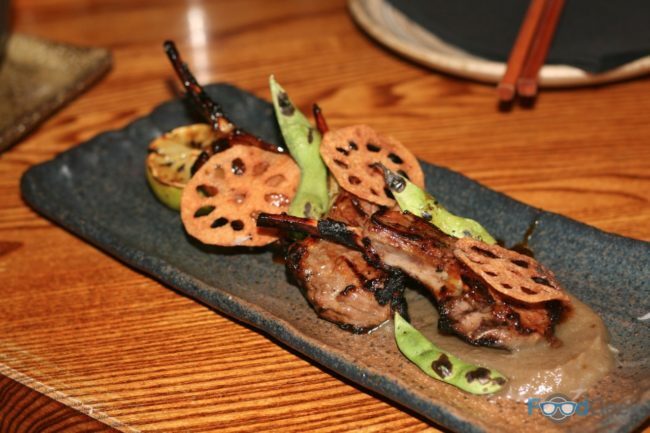 Defo one of my favorite places to eat in Manchester, I recommend the charred lamb cutlets they are gorgeous.